A stable outrigger would be great, no doubt. Stable against what, though? The North Atlantic in winter would defeat ANY outrigger, in my opinion. It would defeat most "Western" designs too, but it was the effort to survive in such conditions that forced the evolution of (e.g.) the Bristol Channel pilot cutters: heavy, seaworthy hulls, of immense strength, designed to stay at sea in almost any conditions, and capable of it too. I wouldn't like to hang around the Western Approaches in October, sailing a Pacific Island outrigger canoe. Nowhere to put the coal fire, to start with. All right, today, I think I finally drew it all together. It sounds like a hotch potch and most of the work was drawing, rubbing out, redrawing, not trying to emulate any particular style but drawing from them. 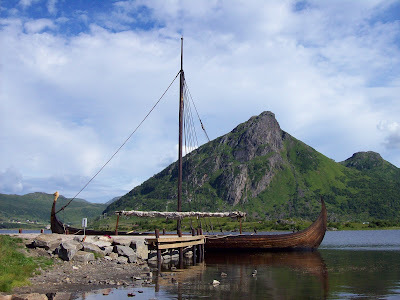 It has aspects of the Viking longboat - 51 feet long and 7'9" wide at the beam but 3'6" at the waterline, high prow and high stern to break coming and following seas. Freeboard is 3'6" at the lowest point but the four beams to the ama are at 4'6", chocked at the gunwhale. It's a curved cabin roof using the same lines as the shell, no need for any deck area, quite heavily built with stringers and arched ribs. There's only just standing room inside at certain points, to keep it low and lean. As usual - shoal keel and underslung rudder, with two masts and a cross between the junk and the Scottish lug rig, stylistically more suited to the longboat. Blending the outrigger into the design was difficult but the ama is a more slender version of the main hull, with added rocker, high prow and stern. The construction would be traditional clinker/lapstrake. It does look cool, though I says it who shouldn't and the motion through the water would be sublime. Gosh I'd love to build this and put to sea in it with a crew of three. In the meantime, I'd love to scan my sketch and show you but I need to buy a scanner first. Time for another post, James! 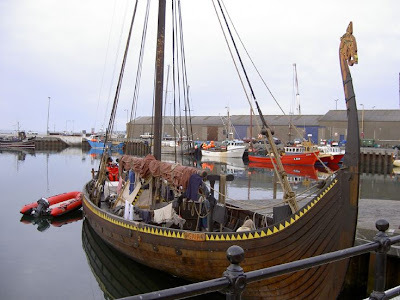 I saw that Viking replica out on the West coast of Scotland in 2007. It was a wonderful sight, but the subsequent TV film showed that it was pretty miserable to live on. I believe flexibility was one of the virtues of the originals, which certainly helped them not to fall apart under the influence of the seas; when we remember, with admiration, the men who voyaged to Iceland, Greenland, and Newfoundland in such craft, we should try to not to forget the much larger number who presumably tried and failed, and of whom therefor we never heard. Human life was cheap in those days. I look forward to seeing your design, James. Yep, miserable with no cocoon over the top. Hi James; I'm considering a similar design for a boat, and wondering if you've progressed any further with your thoughts? In particular, the high prow and stern has me intrigued. Are you still thinking about this? I know it's a long time since this post..
Don, I moved more into the proa or outrigger idea and have enhanced junk sails on that, on two short masts. So, higher sided, narrower vaka but retaining that stempost for splitting the waves. The longboat makes heaps of sense and the low freeboard amidships does not appear to have concerned them all that much. I do think though that you need to accept that your longer length cannot be loaded within 15% of bow and stern - you need to keep the ends relatively light. What I'm saying is that there is, in modern terms, "waste" length. Your rig needs to be somewhere in the region of 0.8 or 0.9 of the LWL, completely different to the modern 1.6 or so for mast length. Two masts make a lot of sense for cruising and using two mains with no triangulars up front makes for ease of sailing. Trouble with this is it gets away from the purist viking square-rigger. With the greatest will in the world [and I love square-riggers], they're pretty well useless on a small craft, where at least some pointing ability is needed. Gaffs have enough trouble as it is. Basically need to get moderate camber into the panels and that can be done but it does require a sailmaker. You can then retain stiff[ish] battens. I don't like the mast stepped way forward - really like the two mast idea but it does lose efficiency, of course, upwind. Perfect downwind. Hull again - high prow and stern. They used it for a reason and the polynesians too. The question of draft. If you go monohull, then you need a canoe shape with some beam. If you go the outrigger way, then tall and narrow section [far more forgiving in big seas]. This latter is used in A Class cats today. Hi James; thanks for all the links! I've read through them and saved them for later reference - plenty of food for thought there. Like you, I've decided to go with a proa, a weight-to-windward equal "L", simply for their seakeeping ability. I agree that the junk rig is just about right (and it looks great, too - the fan shape is my preference). I'm using two masts, again because I like the way it looks, and since the boat is intended to be my home, speed is not so much an issue as is ease of handling. And of course, with shunting in this type of proa, the sails are always outboard. I've mostly been wondering how to finish the ends off (which end is the bow on a proa?) and what you've said is leading me towards the high-curved longship prow and stern. The coastal waters around Oz are generally friendly, but big seas appear out of nowhere every now and then; best to know the boat will handle them alright. Our northern waters have up to 6-metre spring tides, so a boat must take the ground easily too; once again the proa works well, and the high bow/stern should handle beaching in reasonable surf. So far the boat is mostly in my head, and on megabytes of word doc notes, but it moves ahead, if slowly. Better to be sure of the design before leaping into action. Measure twice, cut once, etc. My ancestry is Viking, via the western Isles off Scotland, so with any luck I've inherited the genes for shipbuilding and handling. With 55,000 Km of intricate coastline around Oz, from tropics to snows, I plan to be cruising for a long time. Thanks again for the info, James, and happy boat-planning/building. A word of caution. I looked at the proa but decided on the outrigger. Now, first and foremost, we need to get our prejudice against asymmetrical [I had it, perhaps you don't] out of our head. The idea of the sail and boom lying against the mast is not one most sailors like. The idea of the ama being on one side only and in an outrigger, that means that on one tack, the boat will act as a proa and on the other, as a trimaran, can be got round quite easily. You plan your routes to give you more on the tack you like. Thinking outrigger rather than proa has advantages - the boat is always headed for'ard and that answers the "which end the prow" question. It allows a proper tiller and a shape to the hull which is more natural. You can then go the pacific island way with fair height prow and very high stern or the viking way with very high prow and moderately high stern. In all my looking around, the only real reason for such height is aesthetics. Sure the rocker is great and that's what keeps the nose and stern up but the actual excess height is just for nice looks. The outrigger has other advantages. The proa can't have a tiller, as has been said and if you're cruising, that's critical. Having a tiller allows you a self-steerer. Also, your ama can now become your water and boat spares storage and you can put your head [toilet] over there - keeps the smell out of the cabin and gives you more room. My design has the back half of a two foot wide ama as an open wash area. Do you know how the proa "tacks", Don? You have to allow it to lose way and slide back on the tiller to change direction - it's called shunting. This would drive you crazy if you were working a passage. With tiller, two junk rigs and a shoal keel, you're just setting and forgetting. The junk is a gentle gyber and the whole thing is less stress, feels better, looks better. Please, I beg of you - keep me informed of your progress. I'd say email me but there are readers who are yachties too and they'll enjoy this exchange, so that's why I'm keeping it here. I meant with the shunting that it heads downwind momentarily - there is no tiller involved - and then what was the stern goes forward. I forgot to mention backwinding. With a proa, this is a problem and in a blow, you're over. With an outrigger, it never arises. As a proa, you might run it as asymmetrical for extra lift if the ama is to leeward. If the ama is to windward, there is a less stable situation - if it comes away on a wave, stability is lost. Solution is probably to run two Brucefoils - one to leeward and one to windward. As an outrigger, which I prefer, then the non-ama side's foil will have only mild effect but should be enough to kick in if the amaside foil [to windward] fails. On the other tack, the amaside foil will bear the brunt. It sounds a great solution, curbing the main criticism of the outrigger - when flying an ama. The Brucefoils being adjustable - swinging, moving fore and aft and retracting/extending, would let you, with experimentation under sail, to find your perfect positions which you'd mark on the woodwork. I seriously think on an oceangoing outrigger, the Brucefoils are pretty necessary as a safety outlet. My thinking has gradually swung round to the "harryproa" style of boat similar to the designs of Rob Denney. It will have the rig just inboard of the lee hull, which is 16m long with 1m beam (coupla bunks, shower, toilet), two junk sails, 32 square metres each, masts 6m apart. The main accomodation hull to windward is 12m, 2.5m beam. All flat bottom, no rocker, fairly blunt, high prow. Boat about 4500Kg loaded up. I've looked at the Brucefoils, but I don't expect to be ever going fast enough to use or need them. Any time the wind blows up anywhere near that hard, I'll reef! This is strictly a cruising boat. I'd agree that the Brucefoils would be a very useful adjunct to a boat with an outrigger, but for me that in itself rules the outrigger out; less stability. With this style of proa (and I thought this was true of any proa? ), the wind is always from the same side, pushing the lee hull down, where you want it.